He’ll never be the subject of a Dos Equis commercial, but for political strategists Fred is The Most Interesting Man in America. He’s the 50%+1 voter, the guy whose agreement you need to truthfully say “a majority of Americans believe [this],” the guy whose support you need to win a two-party election. You may know him. If not, you should. So let’s meet Fred. Then we’ll meet the Kossascopes. You may like Fred better. It seems the Fredling, or more likely Mrs. Fred, has been looking at polling data. The two blue figures on the left are liberal Democrats, as about 20% of the electorate are liberal. The blue-purple figure next to them is a moderate Democrat. The Democrats total 33% of the electorate according to April, 2009 polling. The two red figures on the right are Republicans and conservative, and they total 22% of the electorate in that polling. The pink-purple figures are independents. The two wearing red hats on the right are conservatives; the two wearing purple hats on the left are moderates. Squarely in the middle … is Fred. Note: Yes, I realize what follows is an ecological fallacy, assuming the median person of the electorate is median in other ways as well. Still, it’s more likely than not that Fred is near the median in most ways, and those medians let me specify him as a character. Fred is 40 years old, born in 1969. That’s the first important fact about him. The 1960s are history book facts for Fred. By the time he became politically aware, the conservative movement was already ascendant. But he was never a reliable conservative. We don’t know who Fred would have voted for in 1988. He was busy with midterms and forgot. He’s voted in every presidential election since, and he’s always picked the winner: Clinton in 92 and 96, Gore (who won the popular vote) in 00, Bush in 04 (a vote he regrets), Democrats in 06 (first time he cared about midterm elections), and Obama in 08. Fred didn’t finish college. Wanting more financial independence, he found a job he liked enough to “take a semester off” and never got back. Plus he wanted to marry Mrs. Ex, whom he’d met in college. They were both young and it didn’t work out, but then he met Mrs. Fred and they’ve been married for ten years. Eight years ago they had the Fredling. Fred is a bus driver for a company that contracts his city’s bus service. Mrs. Fred has a part-time job, but she’d like to get a full-time job when the Fredling is a few years older. Between them, they make about $49,000 a year, the median family income. They have a small home, and they eke along by being very careful. Fred wishes government were as careful with money and he and Mrs. Fred have to be. Fred likes his job, although with city and state budget cuts he worries about joining the ranks of the unemployed. Some of the unemployed are people who used to be Fred’s regulars, riding his bus each day to and from work. Some still get on his bus, riding to job interviews. Some have given up, and he sometimes wonders about them. That’s how he is. Fred watches TV news and reads some more on the internet, but he gets most of his news from the regulars on his bus. Some of that is them talking about what they saw on TV, heard on the radio, or read in a newspaper or online. Mostly, though, Fred’s news is what’s going on in their lives, because Fred is a people person. He likes to talk with his regulars as they get on or off the bus, and overhears snippets as they chat to each other or on their cell phones. In terms of being in touch with ordinary people’s lives, his “news” is as good as or better than than what he’d get from the media. It’s anecdotal, but that’s okay with Fred. He’s not a systems-and-statistics kind of guy. He takes life one day at a time, one person at a time, and one problem at a time. On the one hand, that means he’s pretty grounded; he knew there was something wrong with the economy long before the media were thinking of using the word “recession,” because he saw it happening in the lives of his regulars. On the other hand, Fred doesn’t have a unifying political theory. He’d like to feel more secure in his job and his home, and he’d like to see his regulars happier than they have been for the past few years. He’d like government to help where it can, or at least not make things worse, and that’s his political theory. Because Fred is a people person who takes life one day, one person, and one problem at a time – based mostly on personal anecdotes from his own life and the lives of his regulars – he’s what George Lakoff calls biconceptual: progressive on some issues, conservative on others, often depending on how the issue is discussed. His core values are mostly progressive values, but he doesn’t trust government enough to be a reliably progressive voter. We’ll talk more about Fred’s life and his politics tomorrow but the key point is that, to elect more progressive candidates or build support for more progressive policies, we progressives need to convince Fred. 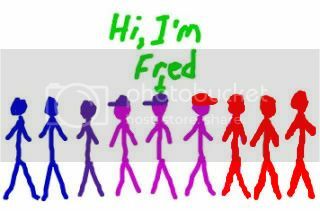 The Fredling’s drawing may be crude, but it depicts American voters pretty well according to the data. Democrats have a 3:2 advantage over the GOP, and 2/3rds of Democrats are progressives, but those facts don’t add up to a progressive Democratic majority. To push our politics more progressive, we must convince Fred that government can make things better or at least not make things worse, and convince him – one issue at a time – that progressive policies will better help Fred, Mrs. Fred, the Fredling, and the regulars on Fred’s bus. Sagittarius – The cold weather starts every year during your sign. Just sayin’. Capricorn – You spilled some leftover turkey gravy right … there…. Aquarius – Yes, there’s stuffing left, if you hurry. Pisces – Yes, there’s some of your mincemeat vanilla sage sweet potato pie left. Lots. Aries – Sure, cranberry sauce sounds like a nutritious breakfast. Taurus – But yes, potato pancakes sound better here, too. Gemini – You dated a bilingual, bicoastal biconceptual in college? That’s bimazing. Cancer – No, the turkey isn’t calling your name. That’s the green bean casserole. Leo – Cranberry sauce on apple pie? Umm, you first, and tell us how it works. Virgo – Second container from the top, third shelf, left side. Yep, that’s it. Libra – Oh, you wanted to finish that cherry pie? Sorry. Scorpio – You were a bilingual, bicoastal biconceptual in college? That’s bizarre. PreviousMorning Feature: What’s So Funny?